The area encompassed in this wildflower bloom report lies from the ponderosa and lodgepole pine forests of the eastern foothills of the Cascade Mountains, extending across the sagebrush deserts to the eastern and southern boundaries of Oregon. The northern two-thirds of Oregon are part of the Columbia River drainage (also known as the Columbia Basin). The Deschutes, John Day, and Snake Rivers are the main rivers that drain northward into the Columbia River. The southern third of the state, encompassing much of Lake, Harney and Malheur counties is considered a part of the Great Basin, consisting of fault block mountains and lakes without permanent outlets. Many of the lakes are alkaline, and others are intermittent, often existing as briny deserts. Wildflower Bloom Reports for Central and Eastern Oregon for 2000. 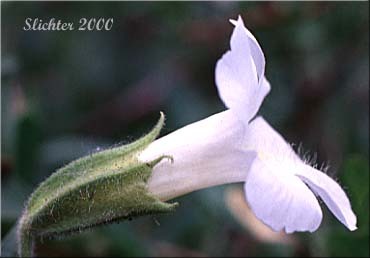 An albino form of Lewis' monkeyflower, Mimulus lewisii from the Steens Mt..........July 2000. June 27, 2000 South Fork John Day River- Between Dayville, OR and Grant Co. Rd #63. June 27, 2000 South Fork John Day River- Near Izee, OR..
May 6, 2000 Oregon Highway 206 (milepost 57.9) Summit of eastern grade from Rock Creek. April 30, 2000 Oregon 218: Summit of pass between Antelope, OR and Clarno, OR. April 30, 2000 Oregon 218: along Pine Creek at MP 19 and at MP24.3 and MP 22.1. April 30, 2000 Oregon Highway 206: Cottonwood Canyon (John Day River), Mountain Viewpoint (near Mikkalo Rd), and summit of ridge west of Condon, OR. Wildflower Bloom Reports for Central and Eastern Oregon for 1999. Sulphur lupine and views towards Pendleton, OR..........May 29, 1999. June 12, 1999- Hunter's Prairie- near Bear Springs Ranger Station, Mt. Hood N.F. - Grande Ronde River Road from its Intersection with Washington (?) to past Troy, OR. May 30, 1999- Buckhorn Campground, Overlook, and Vicinity. Wildflower Bloom Reports for Central and Eastern Oregon for 1995-1998. May 24, 1998- Vicinity of Mitchell, Or/ US 26 from Mitchell to the John Day River/ Oregon 19 from US 26 to Service Creek, OR. March 30, 1997- Lower Deschutes River and Warm Springs Indian Reservation.